"CONUS" redirects here. For the sea snail, see Conus. 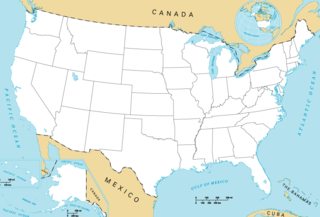 The contiguous United States or officially the conterminous United States consists of the 48 adjoining U.S. states (plus the District of Columbia) on the continent of North America. The terms exclude the non-contiguous states of Alaska and Hawaii, and all other off-shore insular areas. These differ from the related term continental United States which includes Alaska (also on the North American continent but separated from the 48 states by British Columbia, Canada) but excludes Hawaii and insular territories. The greatest distance (on a great circle route) entirely within the 48 contiguous states is 2,802 miles (4,509 km, between Florida and the State of Washington); the greatest north-south line is 1,650 miles (2,660 km). Together, the 48 contiguous states and the District of Columbia occupy a combined area of 3,119,884.69 square miles (8,080,464.3 km2). Of this area, 2,959,064.44 square miles (7,663,941.7 km2) is contiguous land, composing 83.65% of total U.S. land area, similar to the area of Australia. Officially, 160,820.25 square miles (416,522.5 km2) of the contiguous United States is water area, composing 62.66% of the nation's total water area. The contiguous United States would be placed 5th in the list of sovereign states and dependencies by area; the total area of the country, including Alaska and Hawaii, ranks fourth. Brazil is the only country that is larger in total area than the contiguous United States, but smaller than the entire United States, while Russia, Canada and China are the only three countries larger than both. The 2010 census population of this area was 306,675,006, comprising 99.33% of the nation's population, and a density of 103.639 inhabitants/sq mi (40.015/km2), compared to 87.264/sq mi (33.692/km2) for the nation as a whole. The contiguous United States also does not include overseas U.S. territories such as American Samoa, U.S. Virgin Islands, Northern Mariana Islands, Guam and Puerto Rico, the latter of which has a higher population than Alaska and Hawaii. While conterminous U.S. has the precise meaning of contiguous U.S. (both adjectives meaning "sharing a common boundary"), other terms commonly used to describe the 48 contiguous states have a greater degree of ambiguity. Because Alaska is also on the North American continent, the term continental United States also includes that state, so the term is qualified with the explicit inclusion of Alaska to resolve any ambiguity. On May 14, 1959, the United States Board on Geographic Names issued the following definitions based partially on the reference in the Alaska Omnibus Bill, which defined the continental United States as "the 49 States on the North American Continent and the District of Columbia..." The Board reaffirmed these definitions on May 13, 1999. However, even before Alaska became a state, it was properly included within the continental U.S. due to being an incorporated territory. CONUS, a technical term used by the U.S. Department of Defense, General Services Administration, NOAA/National Weather Service, and others, has been defined both as the continental United States, and as the 48 contiguous states. The District of Columbia is not always specifically mentioned as being part of CONUS. OCONUS is derived from CONUS with O for outside added, thus referring to Outside of Continental United States (OCONUS). The term lower 48 is also used to refer to the conterminous United States. The National Geographic style guide recommends the use of contiguous or conterminous United States instead of lower 48 when the 48 states are meant, unless used in the context of Alaska. During World War II, the first four numbered Air Forces of the United States Army Air Forces (USAAF) were said to be assigned to the Zone of the Interior by the American military organizations of the time—the future states of Alaska and Hawaii, then each only organized incorporated territories of the Union, were respectively covered by the Eleventh Air Force and Seventh Air Force during the war. Alaskans, Hawaiians, and non-continental territories have unique labels for the contiguous United States because of their own locations relative to them. Alaska became the 49th state of the United States on January 3, 1959. Alaska is on the northwest end of the North American continent, but separated from the rest of the United States Pacific coast by the Canadian province of British Columbia. In Alaska, given the ambiguity surrounding the usage of continental, the term "continental United States" is almost unheard of when referring to the contiguous 48 states. Several other terms have been used over the years. The term Lower 48 has, for many years, been a common Alaskan equivalent for "contiguous United States"; today, more Alaskans use the term "Outside", though a few persons may use "Outside" to refer to any location not within Alaska. Hawaii became the 50th state of the United States on August 21, 1959. It is the southernmost and so far, the latest state to join the Union. Not part of any continent, Hawaii is located in the Pacific Ocean, about 2,200 miles (3,500 km) from North America and almost halfway to Asia. In Hawaii and overseas American territories, for instance, the terms the Mainland or U.S. Mainland are often used to refer to the contiguous United States. Puerto Rico is an unincorporated territory of the United States located in the northeast Caribbean Sea, approximately 1,000 miles (1,600 km) southeast of Miami, Florida. Puerto Ricans born in Puerto Rico are US citizens and are free to move to the mainland. A Stateside Puerto Rican is a term for residents in a U.S. state who were born in or trace family ancestry to Puerto Rico. Apart from off-shore US islands, a few continental portions of the contiguous US are accessible by road only by traveling through Canada. Point Roberts, Washington; Elm Point, Minnesota; and the Northwest Angle in Minnesota are three such places. Alburgh, Vermont, is not directly connected by land, but is accessible by road via bridges from within Vermont and from New York. ^ a b "What constitutes the United States, what are the official definitions?". www.usgs.gov. ^ "United Airlines website". Archived from the original on April 2, 2012. Retrieved April 4, 2012. Contiguous United States: The 48 adjoining states and the District of Columbia. ^ a b Random House (1991). Random House Webster's College Dictionary. New York: Random House. ISBN 0-679-40110-5. ^ These maps show the contiguous 48 states and D.C., but not Alaska and Hawaii. "Military Bases in the Contiguous United States". National Park Service, U.S. Department of the Interior. Retrieved November 28, 2012. "Soil Moisture Regimes of the Contiguous United States". U.S. Department of Agriculture. Retrieved November 28, 2012. ^ "The Longest Line in America!". Retrieved October 15, 2013. ^ "HowStuffWorks "Geography of the United States - Geography"". Geography.howstuffworks.com. March 30, 2008. Retrieved October 29, 2013. ^ "Resident Population Data - 2010 Census". United States Census Bureau. Archived from the original on October 28, 2011. Retrieved January 30, 2011. ^ "National Geographic Style Manual". Retrieved April 4, 2012. The continental United States comprises the 48 contiguous, or coterminous, states plus Alaska. ^ "United Cargo website". Archived from the original on April 2, 2012. Retrieved April 4, 2012. Continental United States: The 48 adjoining states, Alaska and District of Columbia. ^ "Alaska Airlines website". Retrieved April 4, 2012. The Continental U.S. includes the lower 48 states as well as the State of Alaska, unless otherwise specified. ^ "What constitutes the United States, what are the official definitions?". www.usgs.gov. Retrieved 2019-01-30. ^ a b "Per Diem Rates (CONUS and OCONUS)". United States General Services Administration. ^ a b "U.S. Navy Style Guide". CONUS - "Continental United States." CONUS refers to the 48 contiguous states. It is not synonymous with United States. CONUS is acceptable on first reference. "CONUS" seems to be used primarily by the American military and the Federal government and those doing business with them. ^ "National Geographic Style Manual: conterminous, or contiguous, continental, continental United States". Retrieved April 4, 2012. Use contiguous, or conterminous, for the 48 states. The continental United States comprises the 48 contiguous, or conterminous, states plus Alaska. ^ "National Geographic Style Manual: Alaska". Retrieved December 6, 2013. The continental United States includes Alaska. In Alaska context, lower forty-eight or lower 48 may be used. Do not hyphenate lower 48 as an adjective. The term outside may be put in quotes on first reference if ambiguous. To distinguish the 48 states from the 49 or 50, use contiguous or conterminous. ^ "Learn to Speak Alaskan - Alaskan Language Tips - Princess Lodges". princesslodges.com. ^ "ALASKA: State Profile". Archived from the original on January 26, 2010. Retrieved December 6, 2013. ^ Journal, Copper River Country. "Speaking Alaskan: Words Alaskans Say". ^ Edles, Laura Desfor (2003). "'Race,' 'Ethnicity,' and 'Culture' in Hawai'i: The Myth of the 'Model Minority' State". In Loretta I. Winters and Herman L. DeBose (ed.) New Faces in a Changing America: Multiracial Identity in the 21st Century. SAGE Publications. p. 241. ISBN 9780761923008. ^ Ross, Oakland (June 3, 2011). "Orphans of the atlas". Toronto Star. Retrieved June 5, 2011. This page was last edited on 12 April 2019, at 23:14 (UTC).